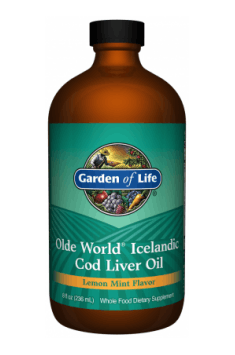 Garden of Life Olde World Icelandic Cod Liver Oil is a top-quality supplement obtained from the liver of the cod inhabiting the purest Icelandic waters. The supplement contains a high dose of essential omega-3 fatty acids and vitamins that support the health of the circulatory system, the brain, and bones. Currently, a large percentage of fish live in polluted waters, which significantly reduces their nutritional value. More and more producers are becoming aware of that fact. In response to the expectations of their customers, the company Garden of Life offers cod liver oil, a natural source of omega-3 acids and fat-soluble vitamins. An obvious advantage of this product is also its pleasant flavour that will satisfy the taste of even the most demanding users who dislike a fishy aftertaste. Docosahexaenoic acid is the first among the representatives of long-chain unsaturated fatty acids. Its particularly large amounts can be found in the brain, where it forms cell membrane phospholipids. It is also a precursor of the happy hormones, dopamine and serotonin, whose responsibilities include not only the sensation of pleasure, but also coordinating the functioning of the nervous system. Eicosapentaenoic acid is another omega-3 acid, a precursor in the synthesis of DHA. It plays an important anti-inflammatory role: it inhibits the activity of the enzyme phospholipase A2. The physiological task of the enzyme is producing the inflammation-inducing compounds. Moreover, the acid strengthens cognitive functions by enhancing memory. Vitamin A is a compound mainly associated with the proper structure of the skin. Moreover, it participates in the restoration of the photopigment without which it would be impossible to see in the dark. It is also believed to have fantastic anticancer potential. Vitamin D performs many functions in the organism, the main one being the regulation of calcium and phosphorus management. Because it supports calcium absorption, it significantly improves bone tissue mineralisation and prevents bone fractures. Moreover, it actively participates in the regulation of the immune system, ensuring proper defence of the organism against pathogens. The normal cell function requires oxygen and nutrients, which are delivered to them by the circulatory system. Its dysfunctions lead to disorders in the action of organs and the tissues that form them. Therefore, prevention is an important element of protection against diseases, as it can delay degenerative processes. A crucial element able to reduce cardiovascular diseases are changes in the diet, which include introducing omega-3 fatty acids. Because of their chemical structure, essential fatty acids (EFAs) can reduce free radicals, formed in metabolic processes. The highly-reactive molecules destroy cell membranes and genetic material, which results in cell death. They can also modify proteins circulating with blood (such as LDL to ox-LDL, which has atherogenic properties). The neutralisation of free radicals significantly improves the condition of the vascular endothelium as well as protects cells from premature death. It is also good to know that DHA and EPA actively take part in the regulation of cell signalling. They are elements of prostacyclin, a compound with myorelaxant properties. It is able to reduce blood pressure as well as prevent thrombocyte aggregation. All those aspects are included in general antiplatelet prevention, which translates into protection from a heart attack and a stroke. The lion’s share of nerve tissue is built from fatty acids that form cell membranes and neurolemmas. The latter enable neurotransmission, and their improper development results in neurological disorders. Moreover, DHA is a precursor of substances used by neurons for communication. One of them is dopamine, a mediator coordinating, for example, the normal functioning of the musculoskeletal system; the second one is serotonin, which participates in the regulation of the circadian rhythm. Without them, it would also be impossible to feel pressure and sexual tension, or maintain proper body temperature. The modern lifestyle promotes the consumption of large amounts of highly processed foods. They are often full of sugar and trans fats, which makes them unhealthy for the body. Another disadvantage of such products is a very low content of vitamins. Because of that, it is necessary to deliver them with dietary supplements. Vitamin D significantly supports bones and joints. It activates calcium cation transporters in the bowel and kidneys on a molecular level. That prevents the loss of the element and enables its much better absorption. Thanks to that, it can be used in the process of bone tissue regeneration. Vitamin D deficiency results in deteriorated bone mineralisation, which, in turn, leads to much more frequent fractures. It is also worth remembering that omega-3 fatty acids have anti-inflammatory properties. Their supplementation helps to reduce the production of prostaglandins, responsible for the initiation of inflammatory processes in degenerative joint disease. That can efficiently alleviate pain and support regenerative processes within the tissues suffering from inflammation. Vitamin A, contained in the product, is used by the organism in many ways. Even in ancient times it was used as a medicine for healthy eyes. That is completely justified, as it participates in the restoration of the photopigment rhodopsin. It is also responsible for normal shape recognition and seeing in the dark. We also know that the retina of the eye contains a high concentration of EFAs. According to research, supplementation with omega-3 acids protects the pigment cells in it. People who regularly supplement EFAs suffer from macular degeneration much less frequently than those who do not. To sum up, Garden of Life Olde World Icelandic Cod Liver Oil is a preparation containing a high dose of omega-3 acids and vitamins, which support the health of the cardiovascular system as well as proper brain function and bone structure. Take one teaspoon per day unless otherwise advised by your healthcare practitioner. The preparation is particularly recommended for seniors struggling with circulatory system problems who want to prevent their progression, as well as those who wish to strengthen their eyes or improve cognitive functions. Supplements containing vitamin D are particularly recommended for post-menopausal women due to the high risk of osteoporosis, caused by reduced mineralisation of bone tissue. It is a good idea to combine this product with calcium, as the presence of vitamin D will make the element more absorbable. Natural lemon flavor, natural peppermint oil, alpha tocopherol.